Lines of flints embedded in the White Chalk cliffs between Ovingdean and Rottingdean in East Sussex. The cliffs tower up to 30 m. in height above the sea at high water, dwarfing even a seven-storey block of flats at Rottingdean. The chalk is formed of the fossilised remains of small molluscs and microscopic marine algae which accumulated at the bottom of the sea in the late Cretaceous period. The Ovingdean Cliffs include layers of solid flint material as well as the flint nodules so typical of Sussex architecture. Flints are rock which has been hardened by a chemical change; flints contain fossils, including marine coral or leafy materials. Despite their ubiquity in Sussex and Kent, the geological origin of flints is still disputed. 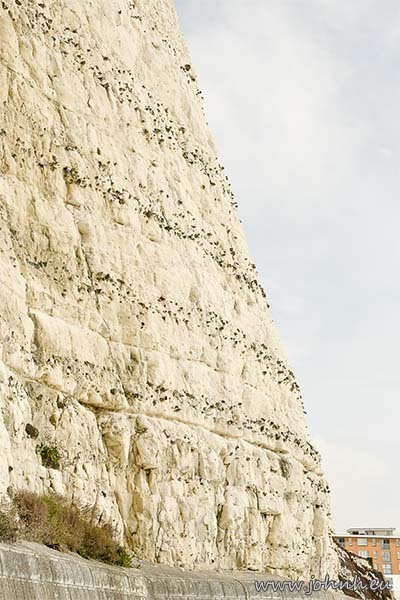 The concrete at the foot of the cliffs, part of the Undercliff Walkway, is the latest attempt to reduce erosion from the sea. 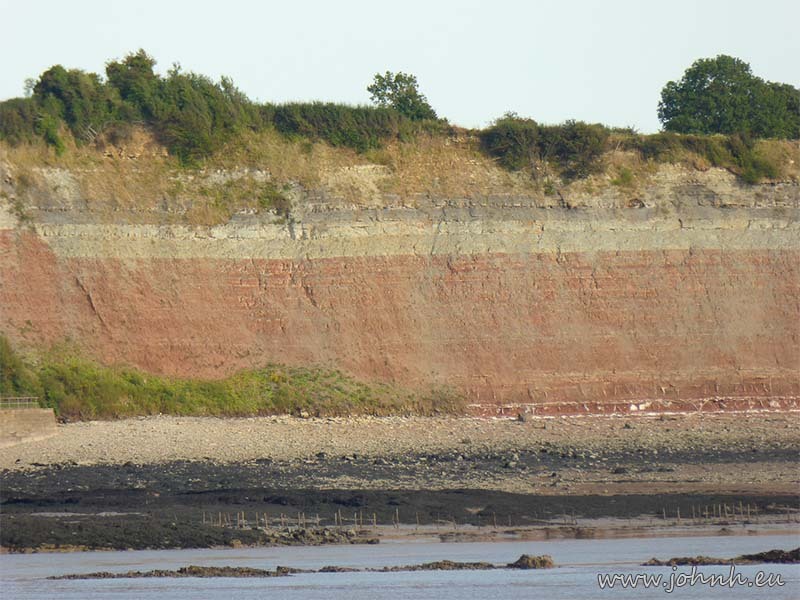 Aust Cliff under the Severn Bridge on the east bank of the Severn Estuary exposes a sequence of layers of rock that both appeal to the eye and to the fossil specialist. It’s a section through an area that was near the equator in the Triassic period, 230 million years ago. The area was alternately a lake (represented now by a layer of red mudstone) which dried out as salt flats (now white gypsum). The upper layers (yellow/green and brown layers) are more recent, 210 million years old, representing a tropical sea; these layers are one of the UK’s most important sites for fossils of marine reptiles. Aust Cliff overall is a site unusually prolific in fossil finds, thus is classified as a site of special scientific interest (SSI). Hiking on the Mont Dore massif in the Auvergne region of France. 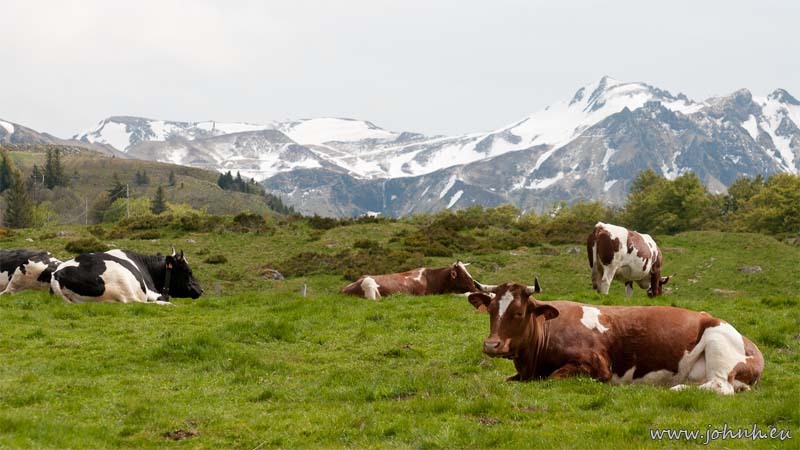 Much dairy agriculture here with many local gastronomic treats employing local cheeses such as St. Nectaire and Bleu d'Auvergne. The Mont Dore massif is described as stratovolcano that has been inactive for the past 220 thousand years. During that time, the area has undergone several episodes of glaciation so much of the topography doesn't immediately strike the eye as "volcanic", at least until alerted to imagine a main peak much higher than the eroded stump which remains. My previous winter hike, on snow-shoes with the peaks still fully covered with snow, revealed the distinctive cone shapes of some of the susuduary peaks of the same massif: see Puy de l'Angle, 1738 m. The Auvergne area still has geological activity, there are hot springs in the spa towns and the west tower of the cathedral at St. Nectaire was severely damaged by the earthquake of 1842. We talked with some French scientists who had been using muon tomography to image some the local features. 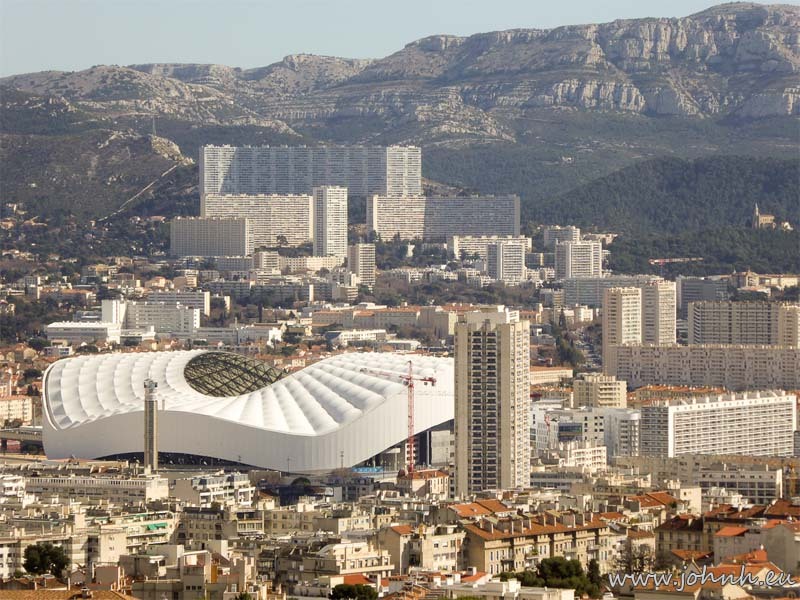 Vélodrome, Marseille, the huge curved white roof of the home stadium of Olympique de Marseille, the football team known as OM. An amazing and appalling view showing the scope and impact of human development in the Anthropocene epoch, framed by the limestone karsts of the « Massif des Calanques », the Marseilleveyre (432 m.) and Puget (563 m.) massifs. Amethyst, native Silicon, Azurite and native Bismuth samples from a friend's collection, clockwise from top left. All of these are naturally-occurring minerals that you can pick up from the surface, if you're looking in the right place. Amethyst and Azurite are used as gem stones; Silicon and and Bismuth are two of the few elements which can be found in pure solid form in the ground. Crystalline Bismuth is unusually dense so the sample feels "heavy" compared to expectation. Thanks Peter.